The Vega Archipelago, or Vegaøyan in Norwegian, is a cluster of around 6,500 small islands in Nordland just south of the arctic circle that surrounds the main island of Vega and is habitated since the Stone Age. It illustrates the human capacities allowing people to survive Nordic conditions in a sea environment. Agriculture (especially the harvesting of the down of eider ducks) and fishing are at present as they were in the past, key fields of labour. This was quite a tricky site to visit, as it's a fair way off the usual Norwegian tourist itinerary. We spent two nights in a small campground in Salhus, halfway between Bronnoysund and the departure point of the Vega ferry. 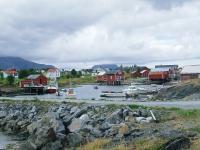 The archipelago itself is largely uninhabited, and only the main island of Vega seems to be occupied year-round. We drove around for a while looking for some interesting highlights to film and coming up fairly short. Obviously it wasn't duck season, so we couldn't find any nesting eider ducks to look at. The highlight was definitely the eider duck museum near Holand on the northern coast of Vega - there is a World Heritage centre here that was opening "very soon" when we visited in June 2018. The highlight of my visit to Vega Island was to see the eider duck museum and nearby duck nesting site at Nes on the north coast of the island. I had been directed there by the young man at the tourist office in Gladstad. It was a longish walk but worth it. 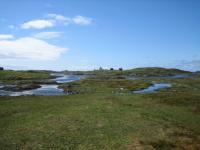 I reached Vega Island by a small ferry from Bronnoysund. Many visitors reach Bronnoysund on the daily coastal ferries of Hurtigruten, but I chose to get there by bus from Grong railway station. I also used the bus service connecting the port of Roroy with Gladstad on Vega Island. Lost luggage and heavy rain and generally in a bad mode I finally got on the “Hurtig-boat” in Brönnöysund, heading for the island of Vega, the largest island in the Vega archipelago. Once out on the sea, the sun broke through the clouds and the harsh and rugged beauty of the 6500 island suddenly became friendly and inviting. My first stop before heading further out in the archipelago was my hotel, the Vega Havhotel, a hotel that turned out to be a virtual gastronomical paradise with guests from all over Norway and from abroad. So visiting Vega without staying at Anna and Jon Aga’s Havhotel would be a major loss. Having chartered a boat, I proceeded out into an archipelago with its flat, small island without almost any vegetation, making me wonder how people actually have survived out here. 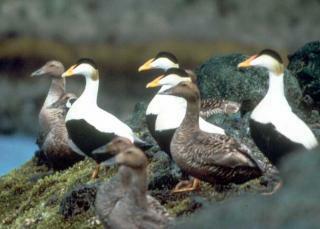 But so they have for over 1500 years, fishing, hunting and also harvesting the down of eider ducks. Even though the outer islands of the Vega archipelago is only inhabited in the summer time, the harvesting of eider ducks is still done today but you will have to be ready to pay some spare 7.000 dollars if you want to take a pillow with you home. If you want escape civilisation for a weekend and feel the beauty as well as the roughness of northern Norway’s Atlantic landscape paired with brilliant food and wine, Vega is the place for you. Role of Women: "The site is a testimony to women?s labour and their control of the eider duck farming."